To many people in the genetic genealogy community Ancestry.com seems to be the “DNA-Testing company that genetic genealogists love to hate™”. After all Ancestry is guilty of many crimes, including not providing a chromosome browser, destroying DNA records and inventing ancestors. Early this year (2015) ancestry.com made their DNA testing available in the UK and Ireland. So, despite all their weaknesses and being naturally curious about these things, I was keen to test with them. I have after all a subscription with them, they publish my family tree online and provide most of the genealogical research material I use. The only problem was that living in Germany I couldn’t order from them. Thankfully they were selling there test kits “Over the Counter” at WhoDoYouThinkYouAre?Live so I was able to buy on “Under the Counter” so-to-say. The good news is that my test results are back and I’ve had a few months to digest the information, so I though it was worth writing a few lines on my results. To put my results in context, and just in case you are new to the blog, I think it’s worth explaining a little of my family background. My ancestral root are all British, so I don’t really need another Ethnicity test. Both of my parents are dead and they were both “only-childs”. As a result I’ve no Aunts/Uncles/First Cousins to genetically test. This means that I’m unlikely to ever be able to phase my data, or reconstruct my parents DNA from the Gedmatch.com Lazarus Tool. I doubt I’ll even get to a point where I maintain a spreadsheet of my DNA linking it to particular ancestor. Heck even my yDNA and mtDNA are relatively rare, but that’s another story. Like my British genealogists what I am interested in is researching my family beyond the time of Civil Registration (1837). If you’ve ever done any research on British ancestors you will know there is a wealth of material from the 19th Century onwards. Typically researchers can rely on Birth, Marriage and Death certificates (searchable here) to give details of your ancestors and the UK Censuses (1841-1911), held every 10 years, to flesh-out family groups. Finally I’m hoping to find connections to the descendants of my ancestors i.e. all those pesky Americans that I’m related to on 23andMe (905 relatives) and FamilyTreeDNA (671 relatives). So far, despite fairly extensive work, I’ve yet to identify a single new relative through either of those two sites. As George Bernard Shaw might have said “Two people divided by a common ancestor”. I’ve already published something about their ethnicity estimates, but to recap, shown below are my results broken down by region. These actually aren’t as interesting as either a.) the spread of results for each region (e.g. my “British” range is between 26% and 89%) or b.) the write-up that they provide on each region which gives a more in-depth view of the whole ethnicity testing process. From what I’ve seen these are fairly common results for a British tester. Given that my ancestors seem to have been settled on the Eastern seaboard of the UK for many centuries it seems not unreasonable to expect to find some Scandinavian and West European ethnicity among my results. In this context it’s worth understanding the genetic mix of the British Isles. The best and most recent study is from the People of the British Isles project. Ancestry’s own comments on the project can also be read here. The other point to mention is the small Caucasian reading. My brother also has a small percentage Caucasian according the FamilyTreeDNA, perhaps they are both background noise or part of a shared ancient connection with the Caucuses that many Brits may share ? 4 Shared Ancestors, 22 4th Cousins. Despite the lack of a chromosome browser to dive in to the data I have 4 matches that have family trees that correlate with mine. One is a relative I’m already in contact with, Two others are a mother and daughter (fourth cousin and fourth cousin, once-removed) and the final one is also a fourth cousin. All four have family trees that make sense, so hopefully these all help validate both their and my research. Of the four realtives, two are UK testers and the other two are US-based testers. Naturally when we get the “shaky-leaf hints” there is the danger that we assume too much and may be missing the correct shared ancestor. 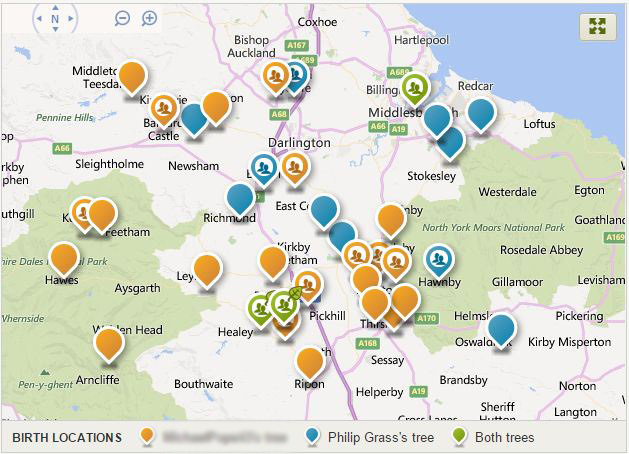 Ancestry’s rather useful “Maps and Locations” page shows how much I overlap with some of my matches! The Ancestry Leaf shows where we have a match, BUT it’s always possible that some of our other ancestors met each other. Just like at 23andMe and FamilyTreeDNA, I have plenty of relatives on ancestry where I have no idea yet how we match (2614 relatives). It would really be appreciated if some of those actually put a public family tree up on ancestry. Ancestry do also have another facility “DNA Circles” but as you may already have guessed I’m not included in any circles. Stepping back from my own results I just wanted to add a few thoughts on my reaction to the ancestry test results. I suspect what I’m about to say next may mark me down as a heretic, however as a relatively normal user I find the current offering from ancestry better than both FamilyTreeDNA and 23andMe. Why ? Ancestry.com took around 3 weeks to process my results. Whilst FTDNA have some very helpful and supportive customer care staff I’m afraid that long processing times seem to be a recurring problem with FTDNA. The reality is that Ancestry has a better website than either 23andMe or FTDNA, that is to say it’s easier to understand and use than either of the other two companies. The Shared Ancestors function may not work correctly in every case, but it is exactly what you would do first with a match on either of the other two sites, namely: search their tree until you found a common ancestor. If that doesn’t work then there are additional tools. Ancestry smartly provides a “Shared Surnames” function, which does exactly what it says on the tin. If that doesn’t help then there is the “Maps and Locations” function shown above. As I’ve written about before, I work visually and like maps. Seeing if/where you have common locations for ancestors is an entirely reasonable research path. Comparing how Ancestry manage and display your family tree with the rather clunky family tree function that FTDNA has built, or the fact that 23andMe have now outsourced their family trees to myheritage.com. Did I mention Ancestry have an offline client (Family Tree Maker) as well as dedicated apps for Android and iOS devices. Genealogy is more than just the Genetics. Genealogy is built around data and collaboration. Ancestry has the data in buckets and therefore it has the community of researchers. Like Google or eBay it’s a natural monopoly situation. Ancestry is, for better or for worse, the “go-to” genealogical website. Ancestry has added a relatively simple DNA testing solution to the mix which it can easily explain to it’s customer base. Contrast this with the other 2 testing companies. I’ve always been suspicious of the long-term plans for 23andMe. Given the Google-based background of 23andMe I assume that their business plan involves attracting enough testers to build a gene-pool big enough to sell on to the Pharmaceutical industry., whilst Genealogy will remain as side-show for them. On the other hand FamilyTreeDNA does everything a genetic genealogist could dream of, autosomal testing, yDNA testing, mtDNA testing, SNP panels, DNA project groups and more. These are all great products (I use them), however you need a reason to go there, so FamilyTreeDNA have to work much, much harder to build their client base. Once you are interested in testing you still need the understanding to know which test to take and how to interpret the results. Once you get the results of your autosomal tests you are then back on your own researching how you are related to someone. I’m a little nervous publishing this blog. Ancestry is a commercial organisation that have proved in the past to be untrustworthy in the eyes of the Genetic Genealogy community. That remains a problem for them. However looking as a British tester I’m at least pleased to have finally found my first “genetic cousins” thanks to them. I suspect over the coming years Ancestry.com’s greater UK presence will result in more cousin-connections. Both FamilyTreeDNA and 23andMe need better strategies to build their base internationally. I’m curious what other people think. Please feel free to use the comments section to give your thoughts. This entry was posted in ancestry.com, ancestry.com, Genealogy, Genetic Genealogy. Bookmark the permalink. 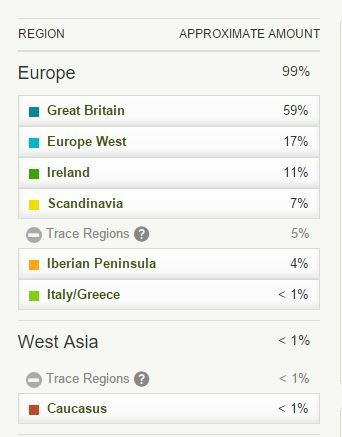 I’m in Ireland and have also bitten the bullet and tested at Ancestry (along with FTDNA). I’ve gotten a couple of promising leads, but for the most part the people I would love to see upload to Gedmatch can’t be bothered. It’s a shame, as without comparing the segments, it isn’t useful for me. I guess that’s the problem with ancestry, getting people to step outside the walled garden… Actually it reminds me that I should just put in a “Next Steps” paragraph encouraging people to uplaod to gedmatch and, if they have $39 to invest, uploading their DNA to FamilyTreeDNA. Expect an update here shortly ! I tested with AncestryDNA at Easter after 4 years on FTDNA. My results are fairly similar to yours. Started with 4 hints and 24 at 4th cousin or less. Now beginning to get some interesting results through. A little disappointed that I still have no sign of a circle or a NAD. Just received my brother’s result this week and I am already seeing the positive effects of testing a sibling. I have also received my 23andme result this week, so I do not have enough hours in a day to make sense of it all. Hi and thanks for your post. I thoroughly enjoyed reading through your blog. We seem to share quite similar experiences – North-East roots and living in Europe. Keep blogging. Thanks. Maybe our roots might cross paths somewhere, sometime. Hope you keep blogging too. For the record, I have done the autosomal DNA test with Ancestry and also with FTDNA. On top of that I have uploaded my DNA profile to GEDMatch. I have established/confirmed a genealogical relationship (GR) with over 20 of my DNA matches on Ancestry (a couple as far as 9 generations back), with promising leads on several dozen more. 1 GR on FTDNA plus a couple of duplicates. 1 GR on GEDMatch plus some intriguing shared matches. I have exactly zero family circles for me on Ancestry; my Australian partner however can boast membership in 11 DNA circles. I would be lying if I said I wasn’t just a little bit jealous. Apart from the gimmicky nature of DNA testing for ethnicity, different DNA tests can produce quite different ethnicity results. Ancestry DNA testing shows me to be 88% British, 5% Irish with trace amounts of Native American amongst a few others. I imagine that would make me more British than the Queen herself. FTDNA testing and GEDMatch analysis of my Ancestry DNA profile, however, shows me to be have less than 50% British ethnicity. For me, the whole point of DNA testing is to establish and/or confirm genealogical relationships – which means you NEED a family tree to go along with the DNA test results. A DNA profile without a family tree is utterly, utterly meaningless to me – doing nothing more than cluttering up my list of DNA matches. Frustratingly, the majority of testers (80%) fall into this group because they either do not have a family tree at all, or only have a very small ‘starter’ tree, or worst of all have a private tree (Grrr!). It seems very un-British of me to concede that the behemoth Ancestry should come out the winner in this contest, but they do – hands down. Size does matter when you’re hunting for needles in genealogical haystacks, and Ancestry’s genealogical and DNA datasets are magnitudes larger than their competitors. The cherry on top is that their family trees are much more user-friendly and feature-rich. Of course, they started out as a family tree service, where the others started out as a genealogical DNA testing service. I also have to say that FTDNA’s family tree feature is painfully slow to use. And I also have to give a big shout-out to GEDMatch because what they offer for free is very impressive. And because they are free, they also have a very dataset of DNA profiles. HOWEVER, Ancestry could be doing so much better with their DNA tools. Working your way through a list of almost 15,000 potential DNA cousins is incredibly time consuming – I must have spent SEVERAL HUNDRED HOURS over the course of a year and I’m still not done! To alleviate the workload involved in ‘processing’ your DNA match list, Ancestry could provide more sophisticated and improved filtering capabilities. It would be nice to filter out (but not delete) the 40+% of DNA profiles that truly have no tree whatsoever. They could also distinguish the ‘no tree’ DNA profiles from those that simply haven’t linked their tree (20+%) to their profile and simultaneously strongly encourage DNA owners to link up to their trees. Ancestry DNA users should also be aware that the name and place matching/filtering does not work very well. Many times, I have found the surname filtering is limited and does not find surnames that I know I have previously seen in trees linked to DNA profiles. Geographical place name matching is also problematic because oftentimes users do not stick to the geographical naming ‘standard’ so the place names get garbled and a place in Yorkshire might be mistaken for a place in another country, even on a different continent. I would also like to be able to filter on ethnicity so that when I am looking for my Irish connections I would like to only look at profiles with mostly Irish ethnicity. And finally, it goes without saying that Ancestry needs to provide a chromosome browser tool YESTERDAY, because we are not too stupid or lazy to use it. Before genealogy took over our lives, many of us had very little understanding of DNA, but with the help of Google and Wikipedia, etc, we have figured out the basics quite nicely. And like the writer of this blog, some of us have figured quite a lot more than the basics (I do not include myself in that group)!